Every 18 months or so, you can count on Adobe releasing a new version of Photoshop. 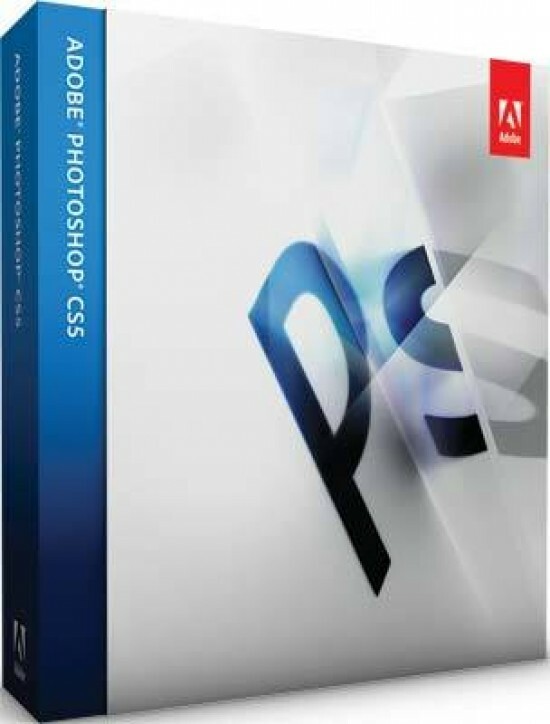 The latest release, CS5, has just hit the streets, and with a tight economy, many people are wondering if it's worth the upgrade or the purchase price. After spending some time with the application, there are certainly some worthwhile features here. Whether it's worth an upgrade is ultimately up to you, but let's take a look at what's new and improved. If you're a Macintosh user, you've been waiting for this. 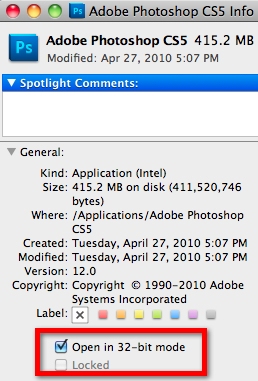 CS5 is finally a 64-bit application on supported hardware (Intel Core 2 Duo or better chips). This gives you access to more memory, and in many cases, faster performance. It's not without it's drawbacks though. There are currently very few third party plug-ins that will work with the 64-bit mode. OnOne Software has just updated the Plug-in Suite to work with 64-bit, and most vendors have promised speedy updates but if you depend on a plug-in as part of your workflow, you'll want to run in 32-bit mode. This is as simple as checking the box in the Get Info dialog (Figure 1). Along with 64-bit support, Adobe is taking more advantage of graphics processors (GPUs) to handle rendering, offloading some of the work from the main processor in your computer, making many operations more efficient and faster. 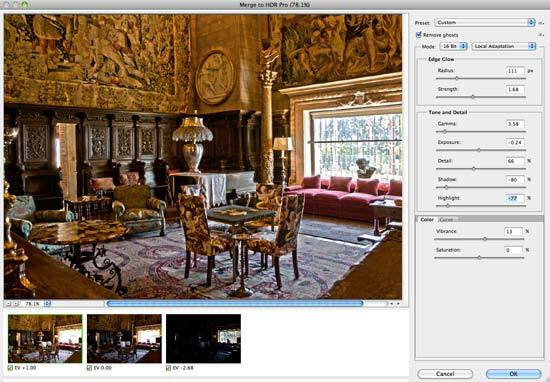 Programs like Photomatix Pro, and HDRStudio have been popular for a while now to combine multiple images captured at different exposures into a single image with extended dynamic range. CS5 now has HDR Pro, found under the File > Automate menu. While it's possible to create the hyper-realistic images that many people associate with HDR, you have full control over the process with one of the easiest to understand interfaces I've seen. The Curves control is very useful for targeting adjustments to specific tonal ranges. In the image shown in Figure 2, I've merged three Canon raw images with a curve adjustment to bring out more of the detail in the window area. HDR Pro includes a number of presets to speed the process, including some monochrome adjustments that do a very nice job of creating stunning black and white images. While you would normally create HDR images from multiple exposures, you can also use HDR Toning to enhance a single image to extend the tonal range. 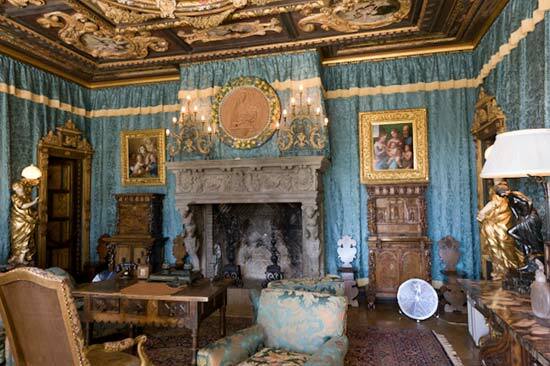 You'll find the HDR Toning under Image > Adjustments > HDR Toning. The interface is the same as the HDR Pro dialog, but, as you'd expect, your editing will be a bit more limited when working with a single exposure. 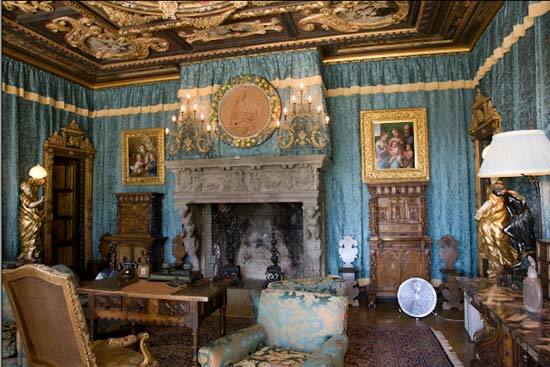 CS5 includes 14 presets for the HDR tool, and you can create or import more. The deghosting and edge glow effects are very powerful and easy to use, giving you the ability to create a natural looking image, or go all out for that processed look that HDR is typically associated with. This feature is one that Adobe is making sure people know about. After playing with it for a while, I can see why. 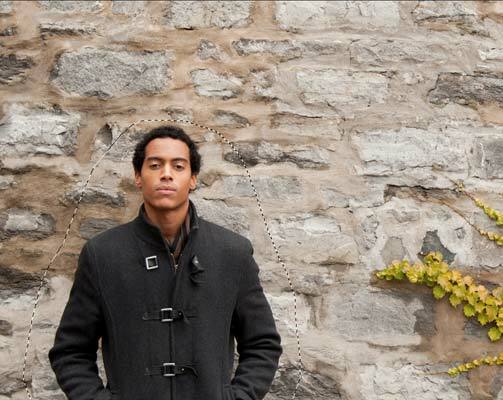 Content-Aware fill can be used in two ways - with the Spot Healing Brush, or with a selection. 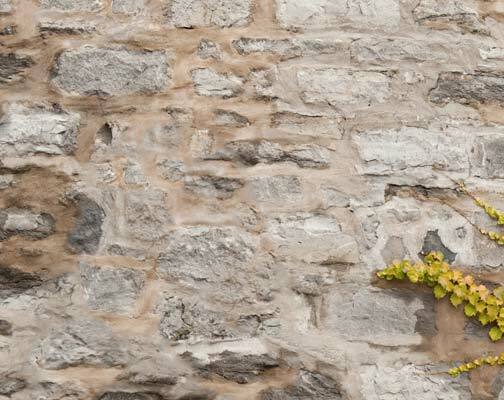 In both cases, Photoshop examines the surrounding pixels and tries to match both tone and lighting of the surrounding areas. While the Spot Healing Brush is improved in the quality of editing, the selection method is where you'll really see some magic happen. Make a selection, like that shown in Figure 3a with the Lasso Tool, and then select Edit > Fill. 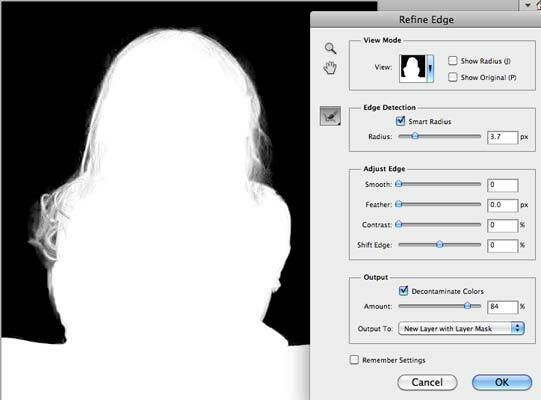 Select Content-Aware from the Use list, and select OK, giving you a edited image that looks like Figure 3b. As you can see, Content-Aware Fill does a remarkably good job of replacing your selection with a texture that looks very natural. In previous versions, this process would have taken a great deal of effort with selection, cloning, masking and other tasks. Masking is always a task, especially when you have fine edges, like hair or leaves. With the latest Refine Mask controls, you can apply a smart radius adjustment to clean up any selections. Combined with the Decontaminate Colors option, you can adjust how the contrast between colors are masked out, giving you very clean selections (Figure 4). Finally, apply the selection to a new layer with a mask automatically. Adobe Camera Raw (ACR) is one of the most popular raw converters around. As the tool evolves, conversions have improved in quality (for fun, try converting a raw file that you had previously done in CS2 - CS4, in the latest version and compare the results - you'll be surprised at the differences). For me, ACR 6.1 gives us the biggest jump in conversion quality yet. It's so different from the previous release that Adobe has actually added a Process option so that you can select how the image is converted. 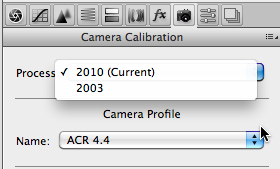 If you open a previously adjusted raw file, ACR will default to the 2003 process. 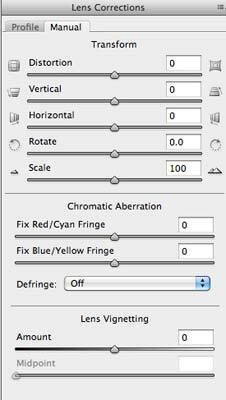 Selecting 2010 from the Process menu on the Calibration tab (Figure 5) will update the image with the latest improvements. CS5 can now use your image EXIF data to automatically correct for lens distortion, chromatic aberration, and vignetting. Photoshop includes a number of lens profiles for Canon and Nikon cameras, and Sigma is providing profiles for their lenses. You can also create your own by using the Adobe Lens Profile Creator tool (download from http://labs.adobe.com/technologies/lensprofile_creator/). 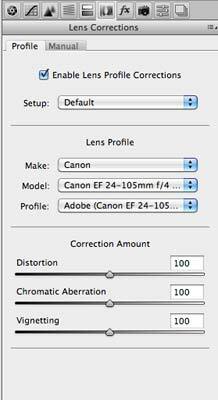 Lens Correction is found in ACR under the Camera Calibration tab. You can tweak existing profiles with the Manual tab settings. Along with standard corrections for distortion and chromatic aberration, the Transform controls will also allow you to change perspective, rotation, and skew. In Figure 8a and 8b, you can see how the lens correction has fixed the distortion in this wide angle image. 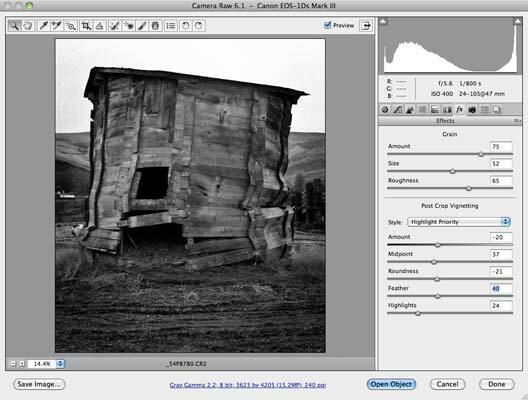 The new Grain controls mimic film grain with controls for amount, size, and roughness. 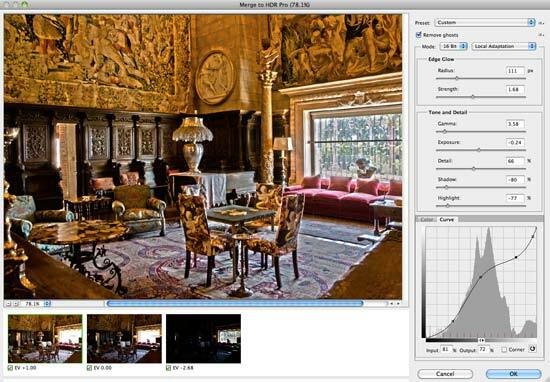 When converting to black and white in ACR, you can simulate traditional films with a great deal of control (Figure 9).